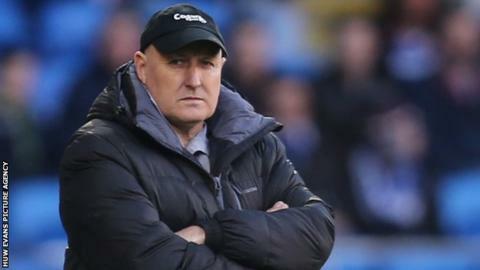 Cardiff City manager Russell Slade says he accepts the views of fans who called for his sacking during the 4-2 home defeat to Watford. Cardiff took the lead but crumbled to their third defeat in a run of five matches without a win. Some supporters reacted by booing and demanding for Slade to be fired, and the former Leyton Orient boss understands their frustration. "I know people are entitled to their opinion, and I accept that," he said. "When your team's not playing well, as we weren't in the second period, then you're going to expect that sort of situation to arise." As well as calling for Slade's sacking, a section of fans also chanted "you don't know what you're doing" after the manager replaced midfielder Tom Adeyemi with young winger Kadeem Harris, though Slade explained after the match that Adeyemi was suffering from fatigue. Pressure on Slade is mounting as Cardiff's winless streak has seen them slip to 12th place in the Championship table, nine points adrift of the play-off spots. "Inevitably when you don't win football matches you'll come under pressure," said Slade. "It's frustrating. We're not in a good place at the minute because we're not doing anything consistently well for any length of time." Cardiff appointed Slade as manager in October, succeeding Ole Gunnar Solskjaer who departed the previous month after less than a year in charge. Although Slade admits he is under pressure, he insists reports that he has met owner Vincent Tan to discuss Cardiff's recent dip are wide of the mark. Slade added: "I'm sure like me he's not over-enthralled by the results, but that's not a conversation we've had."